Located a short two-minute walk from the Daikanyama-station is a cafe which appears at first glance charming, but nothing out of the ordinary. 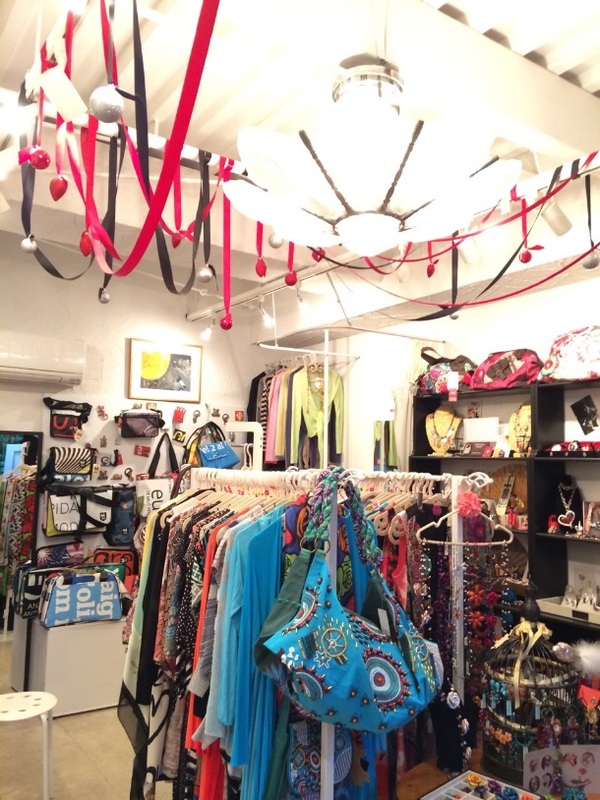 The shop is brightly lit from sunlight passing through the floor to ceiling glass panels. The wooden interior is relaxing, with pop songs playing in the background just loud enough to drown out the details of conversation. 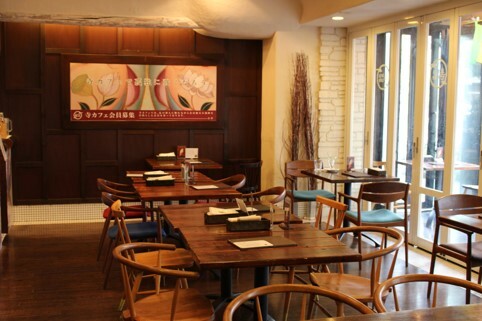 However, in the fashion conscious Daikanyama where chic coffee shops reside at every corner, this cafe has a distinctive feature separating it from the rest; Tera cafe , as the name suggests is a hybrid of traditional temple and modern cafe. Many Buddhist elements are incorporated into the interior, some obvious, and others harder to spot. Entering the shop, one simply can not ignore the statue of Buddha placed facing the entrance. Colorful eye-catching flags hanging decoratively from the ceiling are actually traditional Buddhist flags known as Goshikimaku, representing the Five Wisdom Buddhas. On the walls and counter bar, Buddhist motifs and designs can be seen. But perhaps the most extraordinary aspect of the cafe is the commanding presence of a monk dressed in a kesa ; the robe for Buddhist monks. 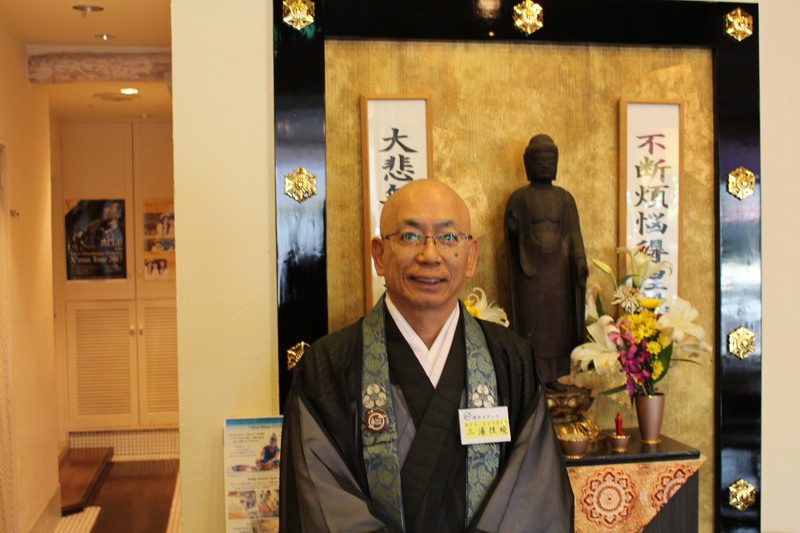 We had the chance to interview Miura Shyokyo , a monk of the Jōdo Shinshū, and representative of Tera Cafe. Jōdo Shinshū is one of the most widely practiced sects of Buddhism in Japan, and except for praying to Buddha, restrictions and strict practices are not required. 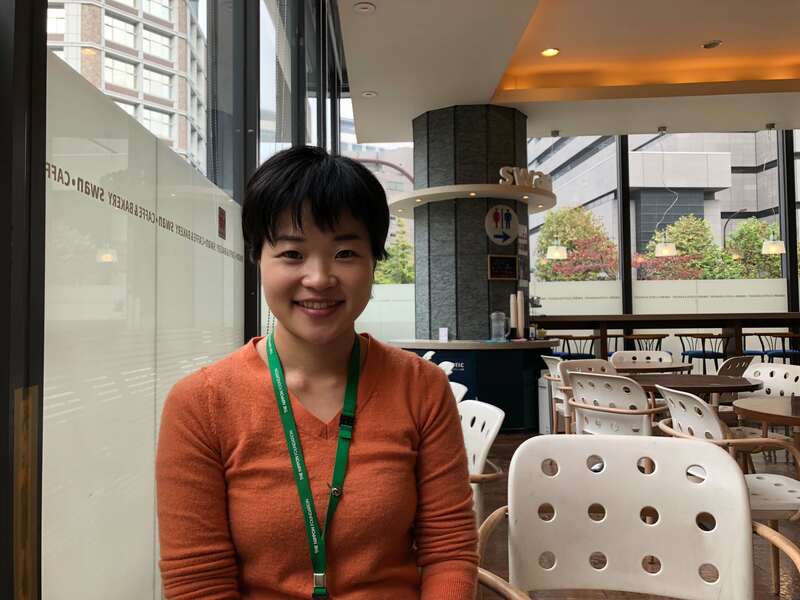 With a down-to- earth attitude, Miura-san says that whilst many consider monks hard to approach, they are just the same as us with worries of their own. He exclaimed, “Monks also drink !”. 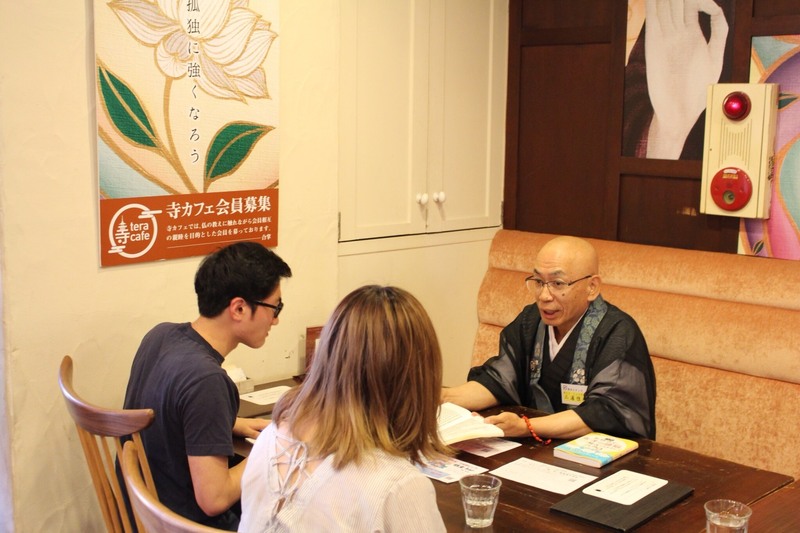 When asked about the motivation behind opening the cafe, Miura-san replied “People who want to learn about Buddhism, people who have concerns in need of discussion, even if we sit and wait in a temple, they do not come. Thus we thought “lets go out onto the streets!”. The cafe did not start out with the same level of success it boasts now. According to Miura-san, “During the first year the Tera cafe logo was all we had. 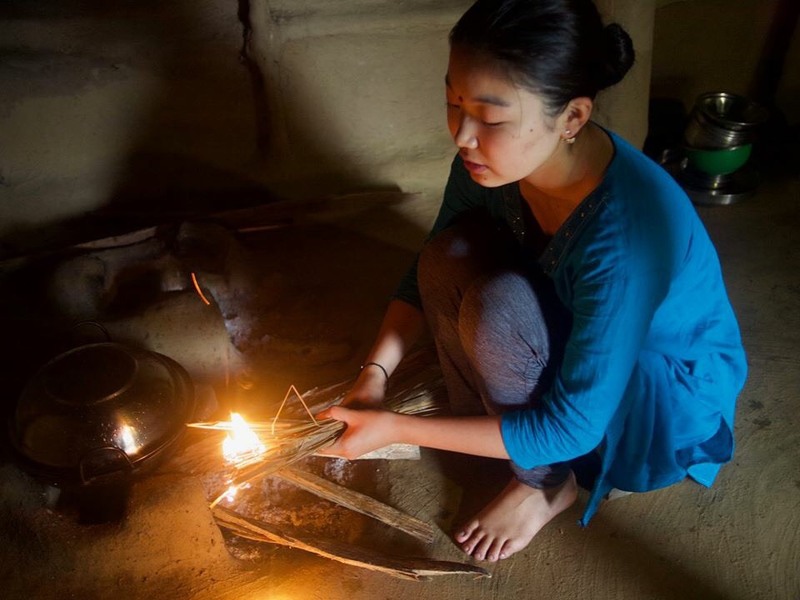 We had to run the cafe without being able to create the image of a temple.” However, over the next five year, Buddhism was successfully integrated into the shop, slowly approaching the concept of a temple. Compared to the beginning, the cafe has come a long way. 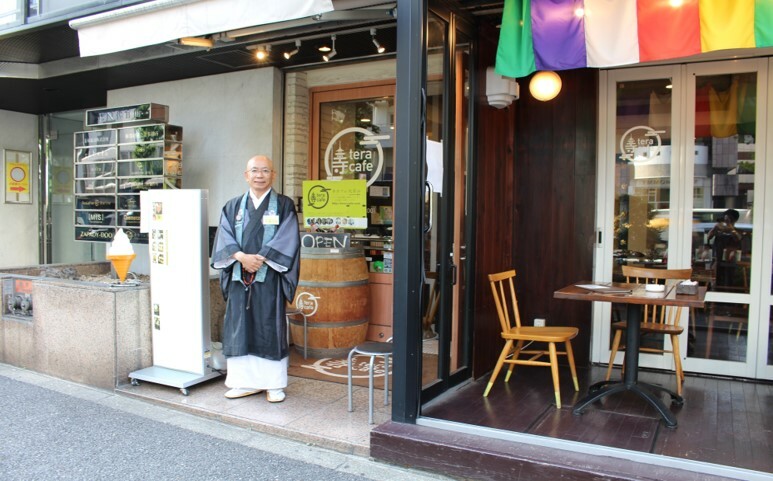 Now, a monk is guaranteed to be at the cafe every day to listen to the concerns of customers and then to search for the right path together. 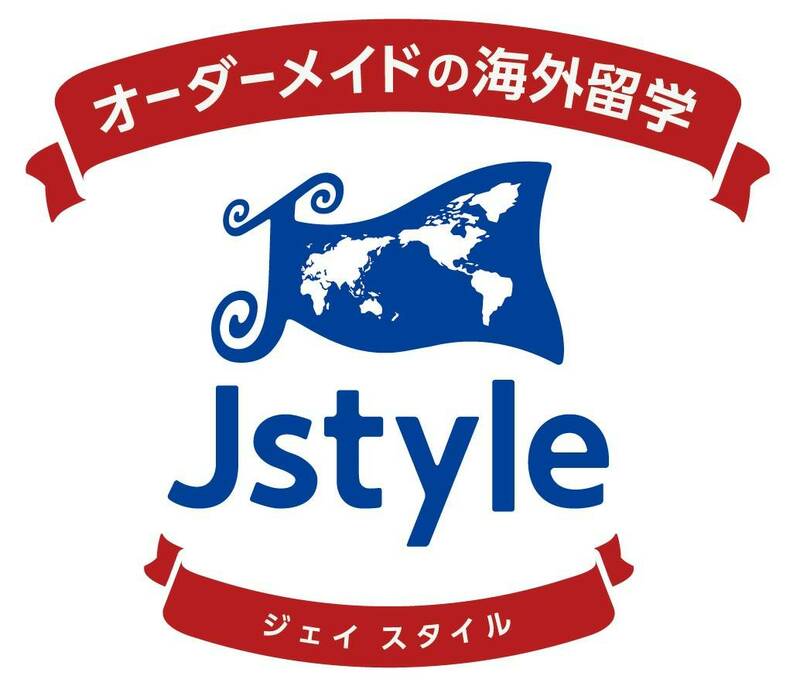 Events are also held regularly, ranging from the more informative Buddhism seminars and scripture transcriptions, to the more casual Bouzu Bar. Bouzu is the word for monk in Japanese, and occasionally at night, the cafe transforms into a bar where people and monks gather to drink and chat. 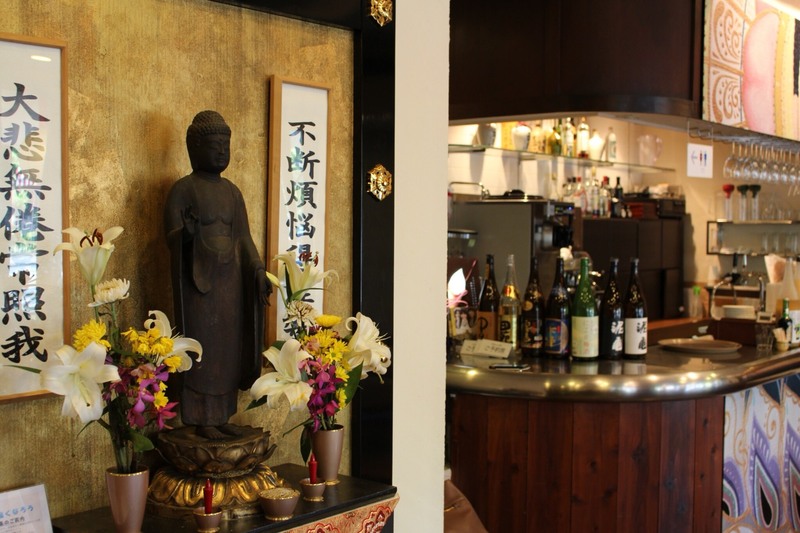 Not just geared toward committed believers, the cafe has done well in attracting crowds with future potential in becoming Buddhist. From the extensive menu accommodating all kinds of diets and the pleasant atmosphere, Tera cafe is a place where one can come to simply enjoy and release stress, whether through meeting up with a friend or conversing with a monks. In the fast-paced modern society where time is constantly pressed, most of us have gotten used to bottling up emotions and keeping problems to ourselves, Tera cafe is a much welcomed addition to the city.